I finally tried something from my new Mary Berry ‘Cooks The Perfect’ book. There’s loads of great dishes and I’m pleasantly surprised by the amount of savoury and healthy ones, as I always associate Mary with sweet treats! 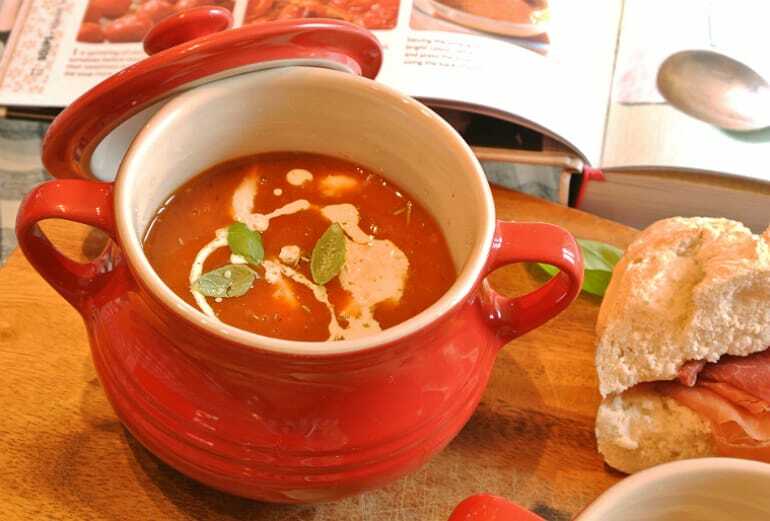 It took a while to make my mind up but I finally settled on a classic tomato soup with a twist: roasted and finished off with cold chunks of torn mozzarella. I’ve had a cold this week so comfort food like soup has suddenly become mighty appealing! The recipe calls for a little sugar but I find small tomatoes sweet enough anyway, so I left it out. If yours turn out to be quite acidic try adding it in towards the end to taste. 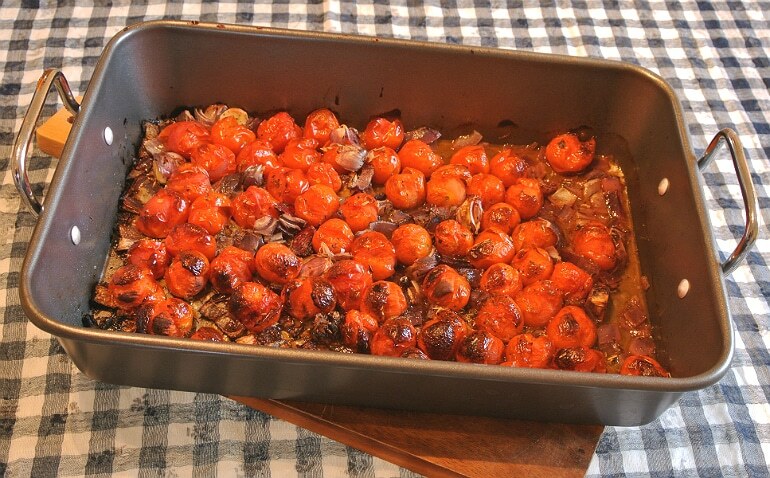 Preheat your oven to 200c and in a large roasting tray scatter the tomatoes, onion and garlic cloves. Drizzle over the oil and season well with salt & pepper. Roast for 35 minutes until you have soft roasted veg. Remove from the oven and add the stock, tomato purée and basil leaves to the tray. Stir to combine with the roasted tomatoes and to get any tasty caramelised bits off the bottom. Transfer the mixture to a blender and blitz until smooth. Then pass through a sieve for a really smooth texture. Serve with the torn mozzarella, some more basil leaves and a drizzle of cream. I also made up some ham baguettes for dipping! Overall it’s an easy soup to make, although I did have an issue with the sieving part. 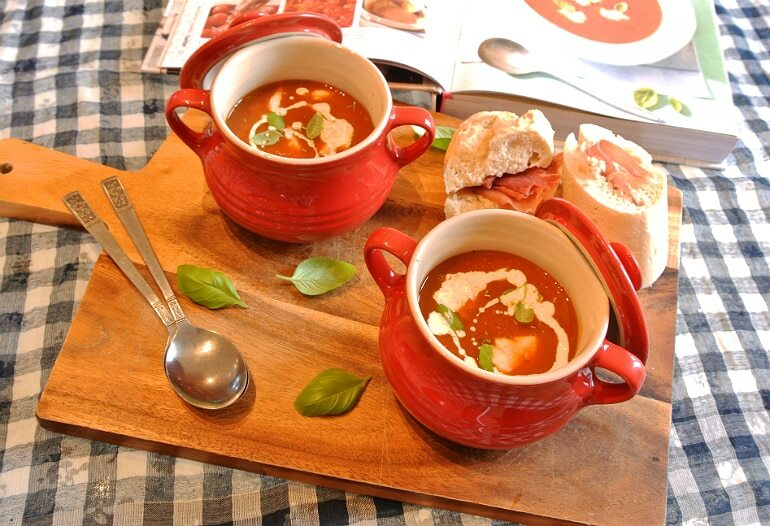 Whilst it undeniably gives the soup a beautiful smooth texture, I was really upset with the about of waste from removing the solid bits of the tomatoes and an awful lot of what I’d cooked ended up in the bin! This also means the volume of soup you get out of the recipe is far less. Mary reckons this will feed four people, but after sieving I only had enough for two. It is damn tasty though and I love the addition of mozzarella! Those cold, creamy bites among the hot soup is a winning combo.